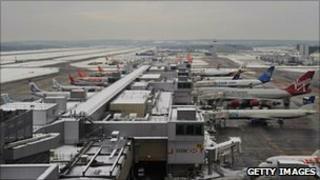 A Wiltshire grandfather spent three days trying to find his way home from Gatwick Airport after becoming disorientated in snowy conditions. Moroccan-born Mohammed Bellazrak's family reported him missing after he failed to return to Trowbridge after dropping his wife off for a flight. Police in Oxfordshire eventually flagged down the 72-year-old after his car triggered a camera in Oxford. They found he had spent from 23 - 25 December driving, trying to get back. Analysis from number-plate recognition systems showed he had driven around various towns in Buckinghamshire, Berkshire and Oxfordshire and on the M4. Mr Bellazrak had no mobile phone with him, and he told newspaper reporters that his sat-nav was not working. Thames Valley Police took him to Oxford police station after he was stopped in Abingdon Road in the city at 2pm on Christmas Day, and after a rest, relatives took him home. He was unharmed by the ordeal. A police spokesman told the BBC it was "nice the story had a happy ending".